When you’re a country boy, there’s always an opportunity. Even though it’s not always legal to take, road kill is a fine example. There’s no sense in letting good meat go to waste when you are more than capable of turning a lifeless animal into usable meat. Even better, with roadkill there are no restrictions like there are with hunting. You take whatever you can find. But that does offer some dilemmas when a situation arises like the one faced by a man in Wisconsin recently who called the local sheriff’s office when the dead deer roadkill he picked up came back to life. The man told Deputy Brian Loewenhagen of the Adams County Sheriff’s Office that he saw the deer lying on the highway as fresh as can be, so he grabbed it by the legs and tossed it in the back of his SUV. Then when he got home, while showing it off to his roommates, surprise surprise. He said he would have called deputies before he picked it up but he forgot his cell phone and didn’t want the animal to cause an accident in the road. “She looked dead, I picked her up like this, she dind’t move. I got back to the house. I got my roommates and said i got to show you something and then whoa,” he told the deputy in a dash cam video recently posted by the department to Facebook. The video quickly caught the attention of local news outlets and gained more than 137,000 views. 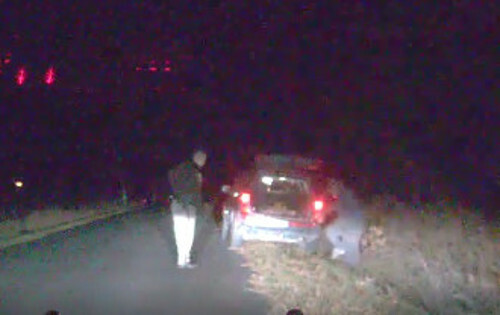 As a nod to the viral nature of documenting such an encounter the deputy even remarks about a similar incident that caught national attention in 2013 when a deer jumped out of the trunk of a car surprising the deputies near by. RELATED: Should Roadkill be Legal? “Did you see the one a couple years ago that was in the trunk of the car?” the deputy asked the man as the deer gingerly exited the vehicle, took a few steps and then pranced back into the woods.